Travel Lifestyle is a child theme of Chic Lifestyle Theme. It’s a feminine focused theme that enables you to customize your website with live preview. 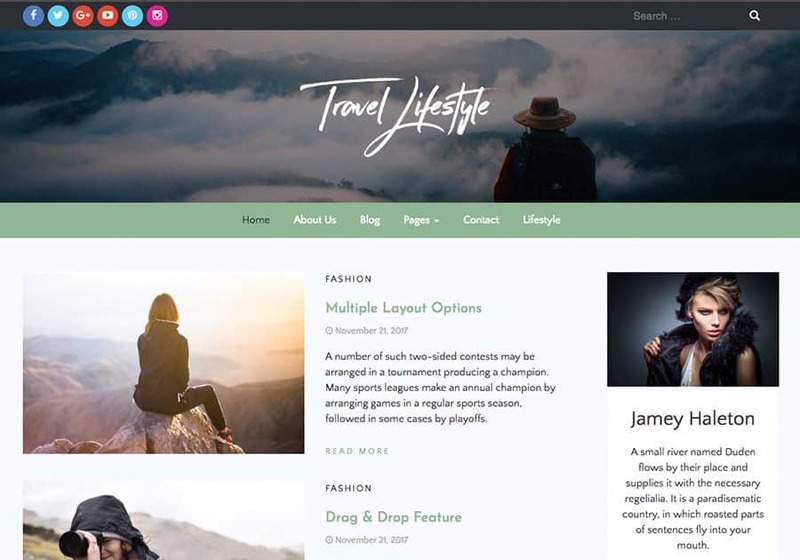 This theme is very lightweight, easy to use, SEO friendly and customizable according to your necessity and desire. Choose from over 600+ Google Fonts. The clean and elegant design make it easy for the user to browse. Navigate easily to get to a particular page with breadcrumb. Theme is compatible with any type of browser. Easily customize your website without any coding. Sections can be modified and tweaked with our powerful option panel. Compatible with all mobiles, Iphone, desktops and other devices. Coded with Search Engine Optimization in mind. Easily share on social media with a sharing option in each page. Using this theme, we ensures that your website will load faster. You can use all our themes for personal and commercial use. GPL Licensed themes. Once you download our theme you can use it for multiple domains for limtetime. 1 year support/update with a single license. If the theme that you bought do not satify you then you can claim for refund in 15 days. We are great support team who are avialable over chat, email or support ticket.